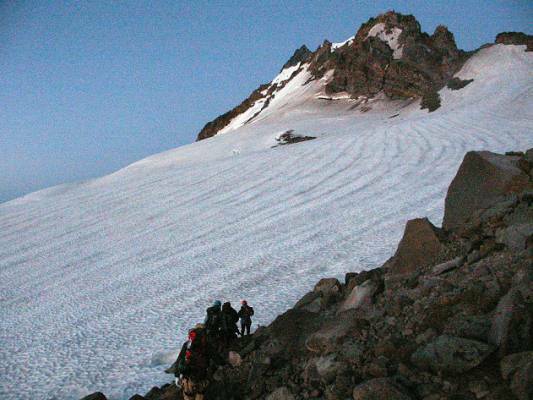 No matter what the conditions, or how you approach it, Mt Jefferson is a challenging climb. In July eight Obsidians joined me in the attempt to reach the top of this magnificent pile of crumbling rock, our chosen route via the Whitewater Glacier. Day one is a backpacker’s dream/nightmare. 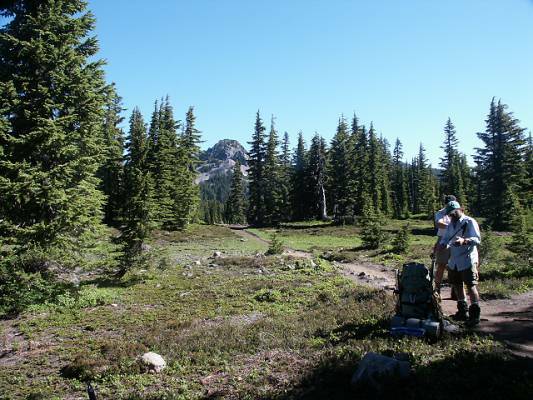 The packs were heavy with food and gear but it is hard to find a nicer walk than the trail to Jefferson Park. The day was turning warm as we hiked through old growth and beside rushing waters; past rocky slopes covered in flowers and showing great views of the mountain and the slopes to come, and so into the lovely alpine meadows and lakes of the Park. It was there that the real work began as we left behind civilized trails, woods and meadows and began to gain elevation quickly, working our way high up the scree slopes and snow fields on the north side of the mountain in the heat of the day. We were all more than ready to drop the packs by the time we reached “the beach” at an elevation of over 8200 ft. The “beach” proved to be more lake than beach, but the winds were blessedly light and all the signs pointed to stable weather for the climb ahead. We rose before dawn on Saturday and were moving out toward and onto the Whitewater at first light. The glacier was in wonderful condition with scarcely any crevasses open. However, even at the break of day, the weather was so warm that the crampons we had carried along were superfluous. 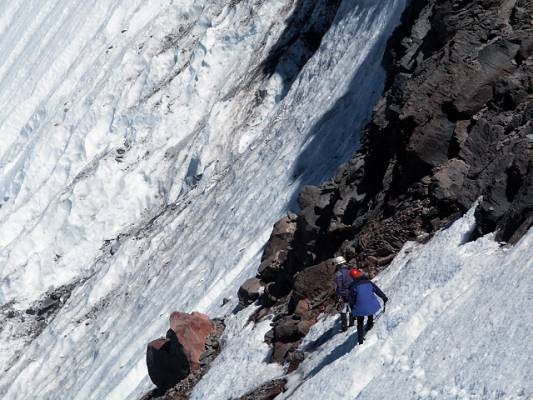 We moved steadily across the glacier and easily accessed the southeast ridge at about 9000 feet. The climb up the ridge went well, though the loose rock is an ever-present danger. Higher on the mountain we found more snow than expected and were forced to use the rope for a couple of pitches on steep icy slopes with a covering of soft slush. When we reached the “Red Saddle” it was still early in the day, we had done well so far; but at that point I made the decision not to continue. 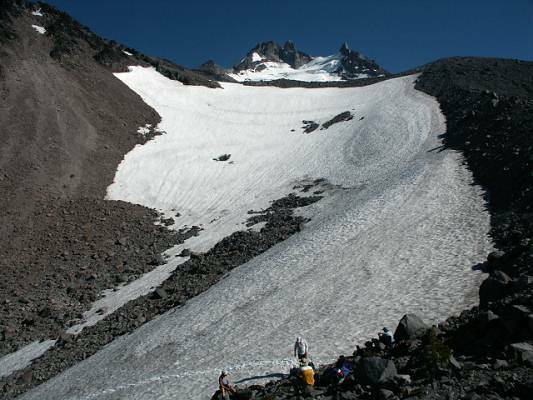 The snow field traverse under the west side of the summit pinnacle was scoured at the start by deep grooves and gullies, caused apparently by rock fall and melting. The roughness of the traverse, concerns of soft snow and the conviction (based on observations as we approached the mountain) that the rock climbing gully on the north end of the summit was very likely full of snow, all combined in the decision to turn around. It was not without disappointment that we retraced our steps back down the mountain to our camp. There we had time for a well-earned meal and some relaxation before crawling into the tents. Some folks moved their tents before retiring, as the melt waters of the hot day were causing a noticeable rise in the level of the lake. 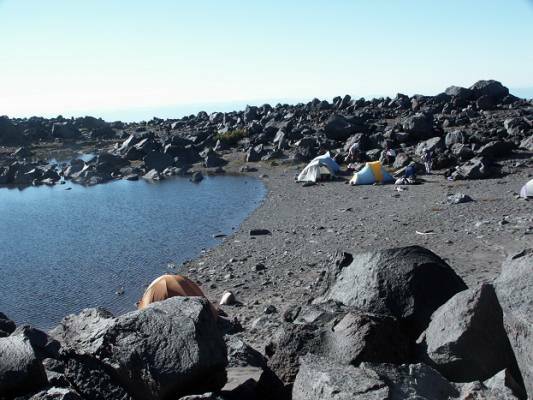 By morning at least one other tent had been moved due to rising water and a wet sleeping bag, and the waters were just touching the leader’s tent, now the lowest one of the group. Sunday’s hike to the cars went quickly. The snowfields were soft enough for a few reasonably good glissades and hiking down the hill is always faster than hiking up! Thanks to my friends and fellow climbers for sharing the time and effort on the mountain; and thanks especially to Maryanne for her invaluable help and encouragement. Though we did not reach the top, I am content that we all learned and gained from the experience. The summit will be there waiting for the next attempt! 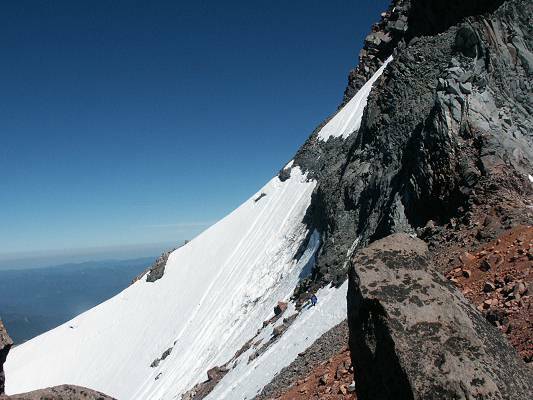 Climbers were: Wayne Deeter, Andy Jobanek, George Jobanek, Greg Milliman, Jason Mueller, Doug Nelson (leader), Maryanne Reiter (co-leader), Mark Slipp and Travis Suggs.